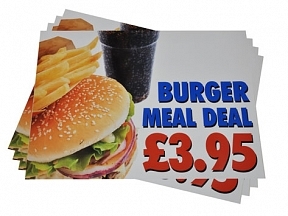 Digitally printed waterproof self adhesive vinyl is used for many indoor and outdoor applications. 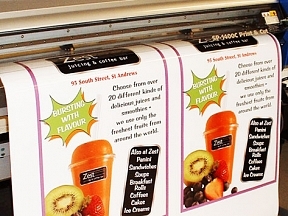 Printed vinyl can be cut into a shape at no extra cost (vector path required). We produce two adhesive strengths. Regular tack is the most commonly used and is suitable for vehicles, notice boards, equipment marking and general signage purposes. High tack is a super high strength adhesive, we introduced this product mainly for engineering companies where equipment may have suffered from paint overspray or the surfaces are not completely smooth. This product is advisable for industrial containers or equipment that maybe subjected to a tough outdoor environment. Please note: High tack vinyl can be difficult to remove. 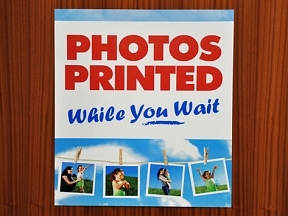 Note: A minimum print run of £20 is applicable to this product. 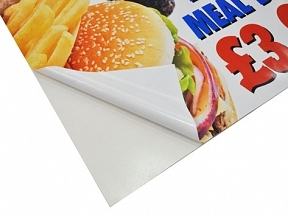 This product is supplied on silicone paper with a clear application film over the top, the clear film is to prevent scratching during application and also helps when aligning your print. 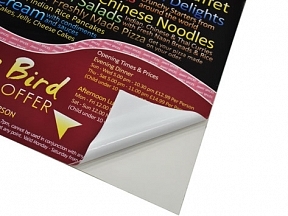 Lead time on this product is just a couple of working days, if your order is urgent, please let us know and we'll do all we can to meet your deadlines.